The effect of a change in a relative price has two effects on the optimal consumption bundle. The substitution effect is the change in consumption that would prevail if the consumer was compensated in such a way that they maintained their original utility level. The income effect is the change in consumption that results from the gain or loss of purchasing power. The Hicksian or "compensated" demand curve is associated with the substitution effect alone, while the Marshallian demand curve is associated with the combination of the income and substitution effects. This analysis of a relative price change is referred to as the "Slutsky decomposition". 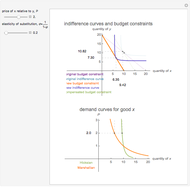 In this Demonstration the budget constraint is given by , and the utility function is , where ρ= . As a special case, define the utility to be when (Cobb-Douglas). The elasticity of substitution is . 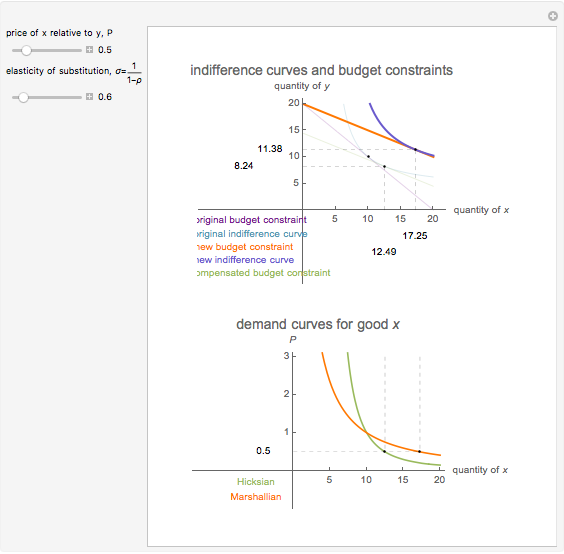 This Demonstration illustrates the decomposition of a price change into the income and substitution effects. The utility function has a constant elasticity of substitution, which is represented by the slider for . The Cobb-Douglas case is the limiting case as tends to zero. In the Cobb-Douglas case (Snapshot 3), you can see that the income and substitution effects exactly balance each other. 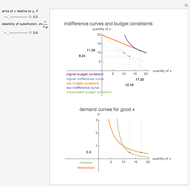 Decreasing makes the goods more complementary and reduces the substitution effect. You can observe the relationship between the Hicksian and Marshallian demand curves for different elasticities of substitution. William J. Polley "Income and Substitution Effects"